Last night, Malcolm Subban made his NHL regular season debut. 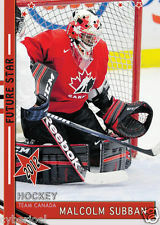 Even though I have never played organized hockey at any level (other than floor hockey at my church), I did grow up in Canada and had the dream of what it would be like to play in the NHL, so I’m sure that Subban has long imagined what it would be like to suit up and play at the highest level of professional hockey in a meaningful game. And while the game didn’t go quite like I’m sure it did in those dreams – he surrendered 3 quick second period goals and was pulled from the game for a stretch before returning in the third period – the fact that he made it is an accomplishment, and the challenges he faced will motivate him I’m sure to keep working hard to be even more successful in future outings. I am a lifelong bruins fan and since starting this blog, I have had the joy of sharing the faith stories of a couple of key players on my favorite team. 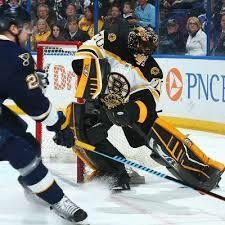 Tim Thomas was a focus during the 2011 Stanley Cup Championship season, and Jarome Iginla was featured here last year. I love to share the faith stories of any player I read about, but it carries an extra joy when it is a member of a team I already cheer for. 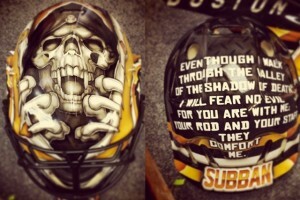 He has chosen to reflect that faith on his goalie masks as well. Check out last year’s full mask pictures here and this year’s here. 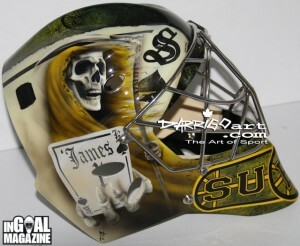 Subban’s 2013 mask Grim Reaper and James 1. 1- Meet them where they are at – I want to thank and acknowledge all the chaplains at all levels of sport. What an important and fantastic work God is doing through you. 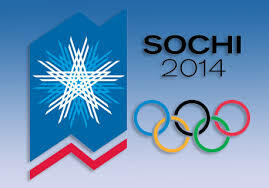 The sporting world is busy especially at the pro levels with travel, public appearances, practice, games and media. Even is high school, college and in Subban’s case, Major Junior hockey, these chaplains bring God into the business and offer athletes, coaches and referees a chance to connect with the Creator of the Universe. I pray for reminders to take God to the world around me so that they can encounter Him and see Him transform their life. 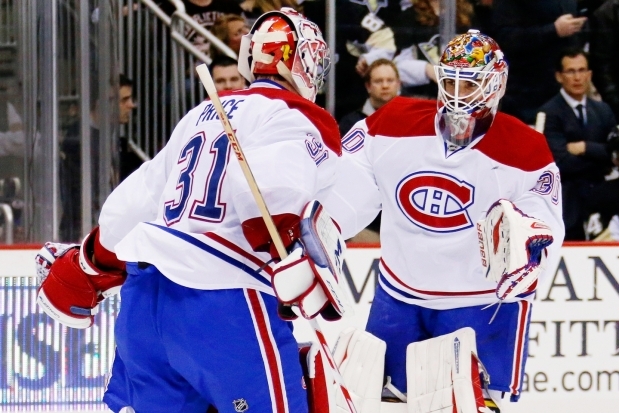 2- God is with us and his enemy is after us – Subban’s masks show the angel of death, or grim reaper. Also included on the mask are bible references or verses that talk about God being with us in the midst of harship, challenges and attacks. It is good to remember that the devil is on the prowl, “looking for souls devour” but also that God is with us and He will bring us strength and comfort. Today, I stick to my allegiances. I’ve been a Boston Bruins fan since I was about 4 years old. It brings me an extra measure of joy to write about a Bruin. In many earlier posts, I’ve talked about names – my own name inspiring the title of this blog. Jarome Iginla’s name is a memorable one, simply for its complexity. His given birth name is Jarome Arthur Leigh Adekunle Tig Junior Elvis Iginla. And each of those names has a purpose as you can read in this project created by a young fan of Iginla’s. 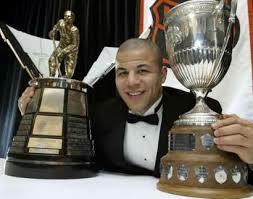 Iginla has had a long and well honored career. 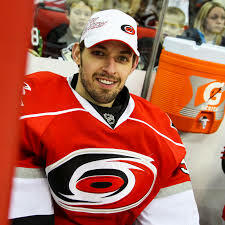 He is a two-time Olympic Gold Medalist (2002, 2010), and NHL MVP (2002), an All-Star (6 games and 3 end of season All-NHL teams), a two-time Rocket Richard trophy winner (top goal scorer) to name a few. 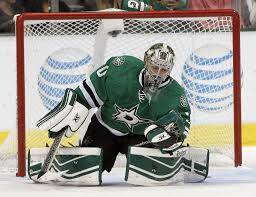 And while he has never been on a Stanley Cup Champion team, I am hoping that this year will be the year. Go Bruins! Known for his contagious smile and joyful attitude which is due to his faith in God. Often referred to as a happy guy with an ever-present smile, Iginla enjoys playing hockey. He credits his grandparents with supporting him when he was younger and encouraging him. And while his upbringing consisted of a many different religious influences (his mom is Buddhist, his dad was raised Muslim and later converted to Christianity, Iginla’s school days were spent at a Catholic school), he believed that God existed in some form. But it was a question raised by a junior hockey teammate when Jarome was a teenager that caused him to do some thinking and soul-searching of his own. His teammate asked “What if there is no God?” After struggling with this for a while, scared that there may not really be a God. He told his dad about his fears. His dad instructed Jarome to pray for peace and if he felt peace, he would have proof of God’s existence. Jarome did, and his fears were eased. 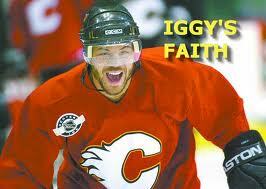 And from there, Iginla has forged a personal relationship with God. Iginla with the Canadian 2010 gold medal Olympic team. 1- Amazing Grace – God is patient with us, allowing us to question His very existence and giving us the choice to accept or reject Him. And yet, when we ask Him to show Himself, He is faithful to let us know He is real, and so is His love. I often feel drawn to people who grow up in church, and learn to go through the motions of Christianity, but without really stopping to consider and believe for themselves that He is real. Who is God to you? Do you really know and believe that He is real? What difference is it making in your life? Is your relationship with Him your own, and not simply something you believe because your parents, grandparents or friends believe it? God offers his amazing grace to each of us, no matter what we are facing or what fears we have, He desires for us to know Him and the comfort He offers in the midst of those fears. 2- Blessed Assurance -What happens when we die? That is a question that we all struggle with at some point of our lives. 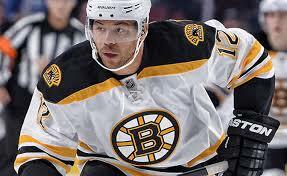 Maybe, like Iginla, we have a general understanding that there is a God, but what do we really know about Him. As we come to know Him and understand who the true God really is, we choose whether we will accept Him and live as He calls us to, or reject Him and live for ourselves. If we choose to follow God, even though it is a hard road to follow, we can be assured that our sins are forgiven, our penalty served and our place with God for eternity is secured. When we know this, we, like Iginla, can be known for our smile and for the joy in our lives. We can live joyfully because the life we live doesn’t need to overwhelm us, God is with us and there is nothing that He is unable to do. And life will get even better when we die to this world and move to an eternity with the Lord of all Creation. 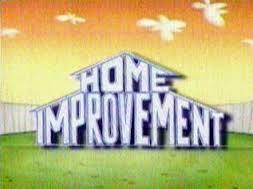 In the 1990’s there was a very popular TV show called “Home Improvement”. It starred Tim Allen as a handyman and TV show host who would try to use his skills to do a project, either a repair or a build. And almost every time, the project would go awry and often lead to a spectacular fail. And the more effort he would put into fixing the problem, the worse it seemed to get. And we would learn quickly that this same problem presented itself in life outside his TV show. When he would face problems in his marriage, parenting , friendships, planning, or many other areas of life, it would also not go as planned and would often lead to more turmoil. Here are my takeaways from Ellis’ story. Ellis – here with the Hurricane – is in his 11th season. 1- We are terrible Handymen! – And yet, even though we have failed so many times to right our situations on our own, we keep trying. We are so hesitant to surrender control and lean on God for help. We try to make things happen in our own time and by our own effort and then seem surprised when they fail or fall apart. I pray that we can learn to trust God in all parts of our life. His plan is always the best. I shared the story of Jonah to a group of kids this week and it seems applicable to this story as well. Jonah tried to carry out his own plan and it was a spectacular failure, but God’s plan ultimately prevailed and lives were changed for the better because of it. And yet we care so much about what others will think about us and the choices we make. We are so nervous about fitting in and not rocking the boat, lest we find ourselves on the outside looking in. But in reality, the worst “outside looking in” we can experience is missing out on the reward of heaven that awaits us for living for God. He is the only one that we need to concern ourselves with and He is waiting and willing to help us live for Him. It all comes down to surrender. Are you willing to give up living for yourself and live for Him? It is a challenge that will face us every day of our lives. I pray that we will learn to surrender control and lean of God to fix our issues. He is the ultimate handyman! 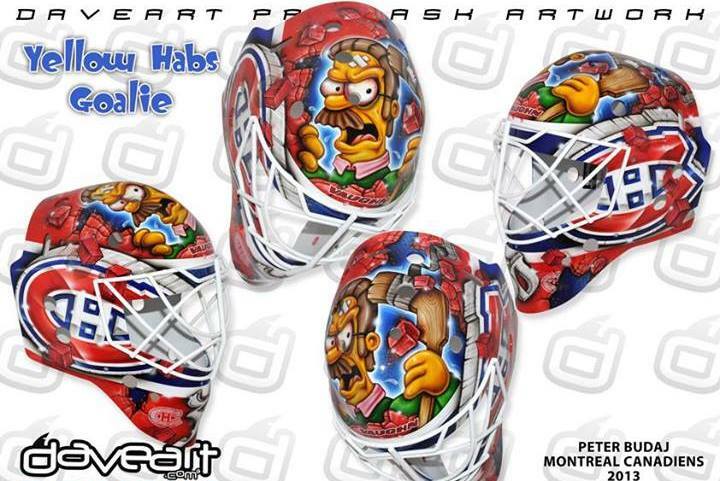 With the Olympics done and the NHL set to return to the hockey spotlight, I will try to tie to two together with this story of Peter Budaj and his eye-catching mask. It started off innocently enough. He was new to the NHL. 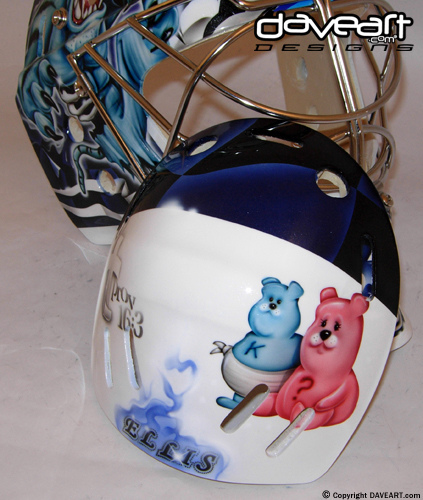 He was a back-up goalie for the Colorado Avalanche and was making the important decision of what artwork he would put on his mask. An equipment manager for the Avalanche, who may not have had the best understanding of what true faith in God looks like, went to the best reference that he could think of. He suggested Ned Flanders – the do-good, devout Christian neighbor of the Simpsons on the popular tv cartoon. While Flanders may be a caricature of how the world views Christians, the point is not to be missed. Even early in his career, Budaj had made his faith known enough that teammates and those associated with the team knew that it was an important part of who he is. And though Budaj is not a fan of the Simpsons – according to this article from Living Light News, he has only seen about 15 minutes total of the show in his life. Budaj, a three time Olympian for Slovakia – and the first Slovak goalie to reach 100 career wins was raised in a Christian home. His dad told Peter just before he left to play hockey in Ontario, Canada at the age of 16 the decision was his – would he like to have a relationship with God or not. Peter chose to hold tight to his faith and it has helped guide his life and career to this point. He knows he has not lived a perfect life. Like all of us, he slips up, but he also sees many opportunities to represent God and to help others know Him, too. And how does he want to represent Christ? He hopes that people will stop seeing God as a big bad God looking to strike people down, but instead to focus on God’s love and forgiveness, available to all. Here are my takeaways from Budaj’s story. 1- Live out Loud – Steven Curtis Chapman sings a song by that name, and the point of it is that people should know us by our actions, by the love we have for each other. 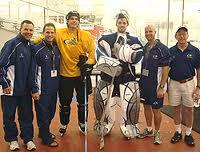 Budaj’s actions spoke loud enough that those around him identified him as a Christian and even in an endearing way. We read in the article that he desires to represent God in a realistic and true way. God is not the mean evil God looking to punish us the moment we stray. He is a loving God who wants to know us and show his love for us. How obvious is our faith to those around us? Are we living out loud for God? Do we represent God in such a way that those who do not know Him would be drawn to Him? 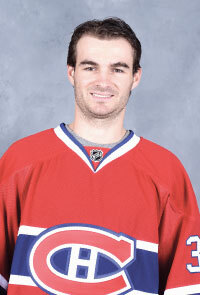 2- Our Own Choice – In the article, we read that Budaj’s dad challenged him to make his choice to follow God or not. He was about to enter a world where depending heavily on faith in God would be important to avoid the trappings that come from success, celebrity, money and the world in general. So when we read later that Budaj is careful in how he is raising his own son, striving to be a Christlike example so Peter Jr. will also be drawn to follow Christ. We would love to be able to make the choice for our kids or others in this life that we love. We can’t. But the way we are living can help others discover who the true God really is. That is a challenge worth taking on. In Canada, while we absolutely celebrate any medal that the Olympians bring home, our national identity lies on the hockey rink. I do enjoy hockey, and of course would love a Canadian hockey gold medal sweep, but I am even more excited to share with you the story of two of the U.S. women’s hockey players. Not only are they Christ followers, but both are from my current home state of Minnesota and are former members of the University of Minnesota’s excellent hockey program. 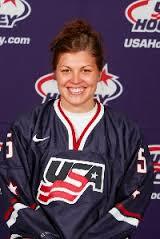 So with the excitement of a “hometown” story, check out the video testimonies of these 2 Olympians. 1- Put on Christ – Marvin talks about putting on the USA jersey and being part of the team. And that the name on the back of her shirt is not the important thing but the team she represents and identifies with. Paul wrote in Galatians 3 that those who are baptized in Christ (acknowledge Him as Lord) “put on Christ” or “clothe yourself with Christ” No matter what we have done and how imperfect and sinful we are, when we are forgiven of our sin it is like we put on His perfection. He covers our sins through his death and resurrection, and we are made perfect, not through anything that we have done other than acknowledging our own sinfulness and accepting Him as our Savior. 2-Give 100% to the one that gave 100% for you – Schleper makes the comment in her video about giving 100% for the One that gave 100% for you. What is it that we are striving for in this life? What are the goals that we have? Where are we putting our effort and our energy. Our one goal and purpose is to keep Christ as the most important part of our life. Our striving should be only to follow His will, wherever it takes us. If we have chosen to live for Christ, and we consider what He did to make a way for us to be with Him at all, then we really have no other choice than to give our all, our 100% to serve Him in all we do and to make everything in our lives acts of worship to God. What a challenge for us! My prayer for myself is that I would put my all into serving Him! 3 – Audience of One – In a related thought, the only thing, then that we would need to be concerned with is living to honor God. The Olympics come with a certain amount of scrutiny. 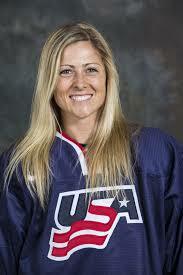 Some Olympians (U.S. women’s hockey team for example) are expected to win a medal, and anything less than a gold would be deemed a failure by some. We can drive ourselves insane trying to live up to the expectations of others. We can kill ourselves trying to please others, and our failures can lead to their disappointment and in some cases vicious attacks. But if we understand that our soul purpose is to live for Christ and that His idea of success tends to be different than the worlds. He is all about bring us closer to Him – even if, as we hear in the Schleper video, He needs to grab our attention through hard things – like injuries. He ultimately wants to draw us closer to Him, we ultimately need to learn that anything we do gives us an opportunity to honor Him. I am greatly challenged by these stories and these thoughts that God brought to my mind through them. May we all strive to honor God above everything else.